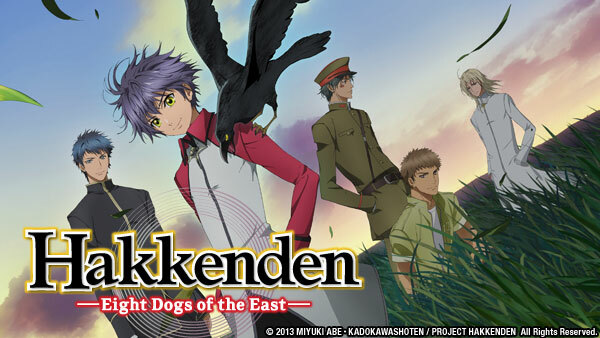 Sign up now to stream Hakkenden: Eight Dogs of the East, subs, tons of dubs, OVA's, simulcasts, plus the all new Dubcast℠ editions and more! Five years ago, a village was engulfed by flames. The only three survivors try to live peacefully in a new city… until a powerful organization sniffs them out! While Shino and Sosuke receive a warm welcome from the Church, Hamaji has a proposition for her kidnapper. Satomi reveals the real reason for summoning Shino and Sosuke. Meanwhile, Hamaji receives an offer she might not be able to refuse. When Sosuke is injured in a fight, Kobungo once again comes to the rescue and shares his unbelievable story. The new moon appears and Sosuke and Murasame must rest, but this leaves Shino in a tough predicament. When Shino becomes interested in a supernatural news story, he takes a trip that could end in disaster. When they discover the gold, the villagers force Shino and his friends to take them up the mountain. On a snow day, Shino encounters an old friend on the familiar train ride home. A question is asked, and the answer may not be simple. Hamaji enters an all female school. When Shino comes to deliver her books, he is promptly met by the campus guard. A man who closely resembles Sosuke is spotted within the Imperial City, and Keno rushes to find him. As Shino recovers from being shot, the group is worried his well-being. Despite waking up, Shino is acting odd. With the curse is temporarily lifted, Shino reverts to his real age... but then he has to deal with Kohaku. Satomi is forced to bring Shino before the elders. Meanwhile, Shino learns some devastating secrets.